Baxter, Stephen. Anti-Ice . HarperCollins UK 1994. Baxter, Stephen. 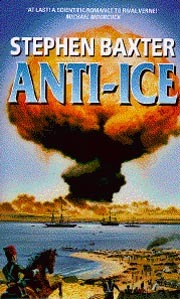 Anti-Ice . HarperPrism 1994. 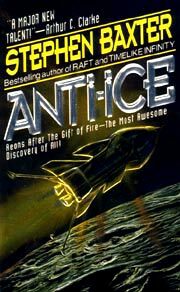 What if: Fragments of an "anti-ice" comet landed the Antarctic in 1720, and after discovering the substance over a century later years later, Britain began exploiting it for technical and military means. Summary: In 1870, as the Franco-Prussian war begins, an act of sabotage against an anti-ice-powered land leviathan results in five men traveling to the moon. After their adventures, they return to Earth to find France about to collapse and Britain apparently readying itself to intervene in the continental war with its anti-ice weapons. Published: HarperCollins UK 1993 (0246138351), 1994 (0586212965); HarperPrism 1994 (0061054216BUY). Translation: German by Martin Gilbert as Anti-Eis , Heyne 1997 (3453126726). Translation: Spanish by Pedro Jorge Romero as Antihielo , Ediciones B 1998 (8440688245).